Back near the dawn of the automotive era, a boater by the name of John Sipe was looking for a way to make his deck shoes more slip-resistant on wet boat decks. He came across the idea of cutting parallel slits in the rubber soles. He tried it and it worked! One thing led to another and the use of "Siping" for automobile tires soon caught on. Siping is a process that involves no removal of rubber, just the creation of slits into the tread blocks. 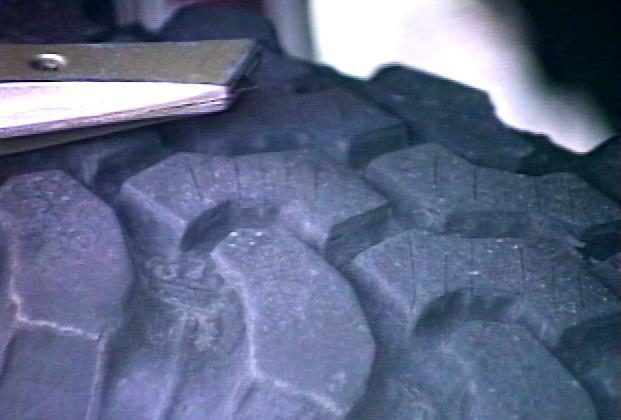 It is very common in all-season and M+S automobile tires, but not too common in off-road "Mud Terrain" type tires, which feature large, monolithic tread blocks. However, there are benefits to be gained from siping these kind of tires. The siping cuts allow the tread blocks to flex and conform to the ground easier than a monolithic tread. In wet and icy conditions, the siping cuts act like "squeegees" to cut through the water and allow contact with the surface below. They also help dissipate heat and prolong tire life. I siped my BFG M/T tires which had about 25,000 miles of use as well as a pair of Super Swamper TSL/SX tires with about 2000 miles. The improvement on the M/Ts was impressive. With my rear locker, it was almost impossible not to chirp a tire when accelerating around a sharp corner, now, it I have to really try to break it loose. I also tested it in the rain with similar results. On ice, I was able to climb a steep hill covered with glare ice in 2WD with ease. Normally this hill requires 4WD to get up in this condition. While it was possible to spin the tires, if I backed off the throttle, they regained traction and pulled nicely. I will described what I did to my tires. I think they work better after siping and I've had no problems with it. You should be aware that siping tires may void your tire warrantee, whether you do it or a shop does it. The Rubber Manufacturers Association, a trade group representing tire makers, neither endorses nor condemns the procedure. It says that it is critical that siping be done properly to avoid ruining a tire. Goodyear Tire & Rubber Co. does not recommend that passenger tires be siped, because the tread depth and the tire body are not designed for siping. Siping could invalidate the warranty if Goodyear determines that a tire failure was caused by the procedure. Also, you should check your state vehicle codes, some states (like VA) do not allow siping tires, at least they will not pass a vehicle inspection. Anyway, siping was more popular years ago, when tire treads were not nearly as sophisticated as today's computer-designed patterns. Nevertheless, a large number of trucking fleets use tire siping in an effort to improve traction and extend tire life in their fleets. Saf-tee Siping, said the procedure is used across the country by a large number of tire retailers that have siped millions of passenger tires through the years. Discount Tire and Americas Tires, two large chains, still offer the Saf-tee Siping service as well as a number of Goodyear dealers! My take, if you have a tire warrantee, check the terms and conditions. If siping will invalidate it, maybe its not for you. If its OK, or you have no warrantee, and you want more traction - go for it! You have a couple of options for siping a tire. If you have a local tire shop that offers this service, that is one. Be advised that "used" tires usually cost more to sipe by machine, since rocks in the tread must be removed. The machines that do siping have a set of ganged round blades that rotate and slit the tread. The tire is placed in a machine that indexes the tire around a full rotation while running the blades across the tread. The only two adjustments possible is the depth of cut and the start and end points of the sipe. I've seen machine-siped tires and one thing I noticed was that they cut nice looking parallel slits, which no regard to the tread pattern itself. 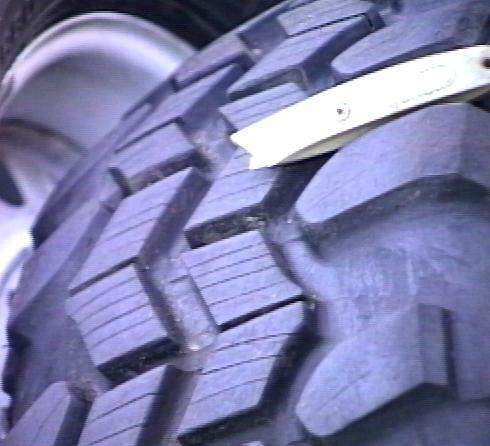 You can and will end up with little slivers of rubber at the leading and trailing edges of tread block. Not an ideal condition IMHO. I would also recommend letting the tread block design dictate the exact spacing and location of the slits. Since tread blocks vary in size and shape around the tire, you may get 3 slits in one block, 4 in the next and 5 in the next. For an expensive tool, you can try to locate a heated tire grooving knife. I looked around a bit and couldn't find any, so I looked for something else. For a cheap tool, I took an old utility knife with an old blade, broke it off and ground it down to a sharp point that projected a bit less than 1/4" from the knife body. You can leave the tire on the vehicle as long as it will turn freely, otherwise take it off for the siping process. Try out the siping tool both pulling and pushing it and use whatever technique feels most comfortable (I found alternating between pushing the knife on the nearest blocks and pulling it for the farther away ones worked best for me). Some people I talked to recommended heating the blade prior to each cut, but I found it worked just fine as-is, at least on off-road rubber compounds, which are a lot softer than the high-mileage rubber on passenger car tires. (I tried the same technique on my Goodyear GLR tires on my VW and found the blade wouldn't even scratch that hard rubber!). One thing you'll notice is the varying width and lengths of the tread blocks. This is done by the manufacturer to reduce tread noise. If you were to use a typical siping machine, which use 6 or more equally spaced cutting wheels, it would be difficult to avoid cutting too close to tread block edges. Doing the job by hand, allows you to control the cut better and follow the tread design better. Below, you can see two of the tires I siped, one a 33x9.50 BFG MudTerrain and the other a 33x15.50 Super Swamper TSL-SX. The Swampers were actually easier to sipe than the BFG as they have very soft rubber. My Custom Siping ToolTM is visible in both pictures. Keen Swamper-Spotters will notice my "chevrons" are not quite factory spec. Before I siped them, I wanted to "soften" the tread up a bit by deeply grooving the center of each block to allow them to flex and conform to the terrain better. To do this, I took a circular saw, equipped with a carbide-tipped blade and set the depth at about 3/8" and then cut each block at the "V". It makes a pile of rubber crumbs and smoke but otherwise works quite well. The saw blade leaves a kerf a bit over 1/8" wide. My Swampers were really rough riding with I first got them. I thought they might "break-in" a bit with use (ha!). I thought the siping would help "soften" the ride (HA!). Turns out they were out of round, so I've since had my Swampers "trued" or "shaved" at Rayhill Wheel and Brake in Visalia CA. It cost me $18/tire and was done on the vehicle. The front tires were spun by the machine and a rotating cutter shaved the tread round. In back, we let the engine spin the wheels in reverse and the cutter did the job. This made such a huge improvement in the ride, with those 1/4" high spots removed. However, I had to re-sipe those blocks where the sipes are gone. Basically free and some time, about 15 minutes/tire. and if you are careful, you'll still have them when you are done! There's an excellent article on Tire Siping in the Mar. 99 issue of Peterson's 4WD and Off Road magazine as well as this LA Times article (search the archives, article dated 17.SEP.1998). If you find any of the above links broken, try to locate the new location of the referenced page and inform me of the new location so I can update my page.